I see people doing this all the time when they try to set up a healthy plate -- not eating enough, not eating enough protein, not eating enough healthy fats, avoiding fat altogether, eating too many carbs... and the list goes on. There is so much debate on how to set up a healthy plate it's hard to pick just one. But in this post, I'm sharing my personal go-to plate template for my clients and the reasons behind them. What's Wrong About the Well-Known "Choose My Plate"
If you've learned anything about healthy eating habits, then you've probably heard about the ChooseMyPlate that's posted all over doctor offices, school, and, sometimes, even at work. If this is the template you're following as you set up your meals... you may actually be setting yourself up for more health issues and increased weight down the road... not the opposite like you may think. The thing is, as this plate describes, you shouldn't be having 50-70% of your plate filled with carbs -- unless you're a professional athlete -- that's too much! Having that many carbs will raise your blood sugar levels causing spikes and crashes which leads to insulin resistance, cravings, extra stress and inflammation in your body. This, if not correctly, can lead to hormonal problems as well as other endocrine issues down the road. I'm not trying to scare you, but it's true. The diet most of us grew up on (such as the Food Pyramid produced by the same organization) is filled with refined carbs and sugars. But this way of eating is one of the big reasons many people in the world have diabetes type II and other health risks due -- it's all linked to chronic unbalanced levels of blood sugar. So how do you set up a healthy plate? Now that I hope you understand better why the common Choose My Plate is not a healthy option, here's what I recommend everyone apply to their plates: 30% fats, 30% protein, and 40% carbohydrates. Simple enough, right? Looking at the image below, you will notice that there is a nice yellow section labeled "fats"... this is SO important and yet it gets left off in many health scenes. Healthy fats are what allows you to eat carbs and still maintain stable blood sugar levels -- the fat is the slow-burning energy while carbs are the fast. To make it even better, healthy fats are also dense sources of necessary nutrients! Win-win. Just like with everything when it comes to food and health, this is a template for the average person. Some people may need more carbs, less carbs, more fat, or less fat depending on their current health status, goals, and what works best for their body. But this ratio does the opposite of what the My Plate one does -- this one helps stable your blood sugar. It doesn't add extra stress and therefore allows the body to function properly and create and send hormones where they are needed. It mitigates sugar and carb cravings -- since these cravings are due to blood sugar crashes (from too many carbs or too little healthy fats in a given moment). It also contains enough protein to allow you to preserve your much-needed muscle! 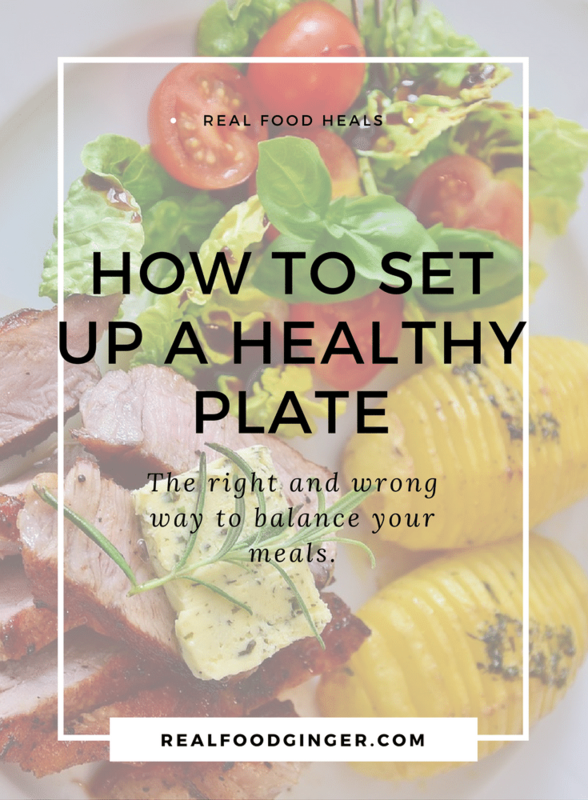 The #1 rule to fixing a balanced and healthy plate? Don't skip the healthy fat!! Eat everything in balance -- not just carbs...! Also, try to balance each plate/snack/meal, and not just your day overall as this will help make sure your blood sugar is stabilized all day long. But overall, you need to find the ratios that work best for you and your body that also keeps your blood sugar levels balanced. This is super important to all areas of health. Have you tried a eating plan that worked well for you? What about one that didn't work so well? If the answer is "yes", share in the comments below -- I'd love to hear about your experiences!